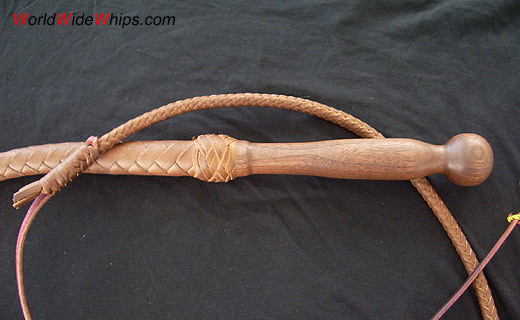 Victor SanSoucie made this 6ft/8plt cowhide bullwhip. The thong is 8plt from handle to tip, giving it a perfect taper, and has two plaited bellies inside like a roohide whip. It is rather light and easy to crack. The turned wooden handle is from walnut and simply polished to a nice silky gloss. Update Feb. 3rd, 2008: the third photo shows two more whips I got in the meantime (left: Bullwhip 6ft with maple wood handle, middle Wood handle bullwhip 6ft walnut).